December 7, 2011 By Paula This post may contain affiliate links. UDATE:The giveaway is now closed…you can view the winners here. Well it’s almost Christmas once again, my how the time flies, and to help spread some Christmas cheer we are going to be giving away a few goodies to help get us all in the Christmas spirit. The first is the Canon Powershot S95 Camera. We bought one of these on our last trip to the US. We had an old Kodak camera that we were using for our business and although it took great photos it was a bit slow and clunky. We had researched for quite some time on what sort of camera to get to replace it with and came up with the Canon Powershot S95. This is one brilliant little camera – we highly recommend it. It’s extremely difficult to take a bad shot with it. The second give away is our Amazonian Profit Plan ebook where we reveal our complete plan for making money online with Amazon. We know many of you own the book already so please indicate in your comments below if this is the case. We will be giving away 3 copies of the book. The third give away is a $50 Amazon gift card. It’s always fun shopping on Amazon. 2. The camera will be posted directly from Amazon and unfortunately it is only available to those in the US. However, if you happen to win and you are not in the US then we will send you an Amazon Gift Card to the value of $300 so before entering ensure that you are in a country that allows you to purchase from Amazon. 3. Since many of you already have the Amazonian Profit Plan and you probably don’t want another copy, don’t forget to indicate in your comment which prize you would like to win to prevent duplication of prizes. 4. We will be randomly drawing the winners. Last year we used a random number generator to do the job so we will be using a similar thing this year. One Canon Powershot Camera will be given away, three Amazonian Profit Plan ebooks and one $50 Amazon Gift Card. 5. The competition will close midnight December 24 and the winners will be announced on Christmas day. I would love the camera but also wouldn’t mind the $50 gift card as well! wow this is really great….I’m always waiting the post from this blog, and the newsletter of course. I have the ebook (love it) so I would be jazzed to win the camera or gift card. Happy Holidays from the Midwest to you in Oz! I would love to win the camera — thank you so much! Thanks for the offer :) What a great idea for xmas. I’d love either the first or the third prize because I already have your great book! Wishing you an awesome christmas and I know you’ll have a great 2012. You are so very generous, Paula and Wanda! The camera would be nice, thanks for the opportunity. Thanks for the offer:-) I have the Amazonian Profit Plan already so either the camera or gift card would be lovely. I thought I would try again-you never know, right? My first choice would be the e-book-I still do not have a copy, but I would take the other prizes also. This is a great touch from both of you! I sure would love to win the camera! I want Amazonian Profit Plan. I would love to win the camera. I would love the $50 Amazon GC. I am so glad I came across your blog a couple of months ago as I have learned so much from you both. I have always been amazed how you take the time to answer peoples questions. Anyway, if I were lucky enough to win, I would love the Amazonian Profit Plan as money is a bit too tight for me to buy it at the moment. Best wishes and happy Christmas to you both, and everyone else too. The $50 gift card for sure. I have sooooooo many books on my Amazon wish list, I’d spend the $50 on books. Cool contest. I missed last years. Not this year. I’ve only been reading your blog for a couple of months. I would love to have a copy of the Amazonian Profit Plan. I’m confused as to whether we were just suppose to pick one prize or not, so I’ll just say I would be happy to win any but my order of preference would be camera, gift card, and then ebook. I would love to have a copy of Amazonian Profit Plan if I were lucky enough to win. I’d love to win the Camera! I already have and love APP! I’m open to any of the prizes. Thanks for the opportunity to win something cool on Christmas morning. I love Amazon and would love to make more money from it, so I would love a copy of your book or the $50 gift card! Happy Holidays and thanks for the great info all year long. If I win, I choose the Canon S95. It looks like an awesome camera. If the camera is already given away, then I would choose the Amazon gift card. Thank you for providing the contest, and the excellent content you provide about being an Amazon affiliate. I have learned a lot from you. Having TWO new grandkids this Christmas, the camera would be awesome for capturing those special moments. Thanks and a happy and blessed Christmas season to you and your families. Okay, I liked and shared on Facebook! I already have the Amazonian Profit Plan so if I’m lucky enough to win, I’d be thrilled with the camera or the gift card. I’ve been following your blog for quite some time, and literally soak up the details that you share in every post. As I already own the Amazonian Profit Plan, I would be thrilled with the camera or the gift certificate. Have a Merry Christmas & a profitable New Year! I have your ebook and highly recommend it! My first choice is the gift card. Second choice is the camera. Thanks, Paula and Wanda for being so generous. You both are great. Wishing you and yours a happy holiday season with lots of sales! Wow. Give me the ebook please it’ll pay for the camera and more than double the gift voucher. Honestly, I’d love any of the gifts (of course), but have my fingers crossed that I win a copy of the Amazonian Profit Plan. My little Amazon site has been bringing in a trickle for the last two years or so (!) and I’d love to learn how to improve it. I’ve been wanting to buy a copy, but cash is tight right now, and the holidays aren’t helping any! I have liked your FB page!! I’d love to win the camera because my current camera seems like giving up the ghost and I love photography as you can see on the website I mentioned. However, a gift card would also be quite useful in order to afford a new camera if mine dies. I’m sorry I don’t have a Facebook account but I’ll mention your website on my photo stream. Thanks for the chance for a free gift. Very nice. I already have APP. Charles’s last post… How sad is it to see all things links on these posts for a free gift. Kinda sad! I love your blogs and can hardly wait to read each new one that comes out. I already have your e-book and have followed your instructions as best as I could. I am also a student of James Martell and I definitely agree that patience and perseverance are the keystones to success. Thanks for offering such great giveaways. Hi to you both. I’ll go for the camera. You guys are so neat to do this each year. I’d love the camera but the gift card would be appreciated, especially since I have no gift card at this time! But the biggest gift has been the year long conversation your blog provides and all the good info you share. I really enjoy reading your blog! It gives me much inspiration to work hard, and be successful at internet marketing. I live in Canada, so the best gift for me would be the gift card. P.S. 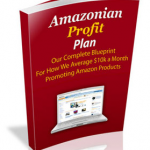 The Amazonian Profit Plan is an excellent ebook! I would love the ebook, camera, or gift card. I’ve been really good this year! I already have the APP and don’t need a camera…also don’t have anything I need from Amazon. SO, if I win, please draw someone else. I just wanted to say that I think you guys rock. You provide solid advice, and opinions, and I am always happy to read your latest emails. I’d love to get the camera. Hopefully i will win. I’ll share this page on my Facebook even in my Twitter account. Thank you and merry Christmas in advance. You guys are great! I would love to win that camera. If we are allowed to put down a second choice, then I would also like the gift card (I already have the APP). Thanks! I’d like to win the Canon Powershot S95 Camera! “Liked” you on Facebook! Thanks so much for the contest. Would not mind the camera happy holidays to all. Wow! You guys are great!! Would love the camera or the gift card! Thank you for the holiday contest. I have the APP so either of the other gifts would be nice. The Canon Powershot S95 Camera, for sure! I would love to have the Amazonian Profit Plan ebook, learn and implement all the tricks you taught, make tens of thousand of dollars and buy all the best Canon cameras at Amazon.com. This is my Christmas wish. Please make it come true. Love the camera. I have 2 canon cameras and would not change brands. Thanks for this opportunity and Merry Christmas everybody. I would really love to win the camera.. Remember your old posts about profits from Amazon, are things still going as good as it did in those posts? Even the lurkers will come out for this one! I’d like the Amazonian Profit Plan! Merry Christmas. I really appreciate your giveaway. I would prefer the camera or the gift card. Thanks! Thanks Paula & Wanda for the Christmas 2011 Giveway, I would like the Amazonian Profit Plan please. What a to start the new year! The kind of lessons inside APP would be priceless no doubt. Gotta say the blog looks grouse with the new theme. Kudos. My Mrs would love to get an Amazon gift card. I’d like to win an Amazon card (instead of camera). The camera is a good prize, but i live in Russia, not the USA. If your randomizer happens to land on my name I would be happy with the camera or the gift certificate. However, that isn’t the reason for my comment. As this year winds down and I reflect upon what you have shared either personally or through guest writers, it has been an amazing amount of information. I look forward to what you have to share in the coming year. Oh, I almost forgot. I’ll leave the cookies and milk by the fireplace awaiting that Christmas morning gift. Here is wishing you and and all of your followers a fantastic Christmas and APP New Year. If I become the lucky winner of your Christmas Giveaway, I would love to be able to receive the Canon Powershot S95 Camera. I have recently been looking for a new camera and have found them all to be very expensive. This would be an amazing Christmas present and I would just love to thank you both for this opportunity. I hope you both have a Merry Christmas! Thank you for all of your posts on all things Internet Marketing. It is a really great supplement to your Ebook. If I win something, it would be great to get the Amazon gift card. Thank you and Merry Christmas!! If I win, I’d like prize 1 or 3, that would be awesome! Thanks. I’d like the Amazonian Profit Plan if I win..as the saying goes, teach a man how to fish and he’ll feed his family..well in this case teach a man how to make money on Amazon and he’ll buy his family a Canon Powershot camera (and probably a lot more besides). Thanks for your generosity. I’d love to have the Amazonian profit plan if I win please. Merry xmas from a fellow aussie! I would love the camera. My camera broke last spring :( I’m missing capturing memories of my family. Thanks for the opportunity. I would love to win the camera. Everyone and their mother has a digital camera except me. I’ve been told that when one of my family members “trades up” I can have their cast off and that it will be all mine. Please. One can die of old age waiting for that happy day. Lady Luck Random Generator, be kind. I would love to win the Amazon gift card, since I have a camera and purchased the Amazonian Profit Plan when you first released it. Merry Christmas! I would love to win the camera! We just bought a house and we will be having family over around the holidays, it would be great to have these memories in pictures. Pick the Hallsted’s!!!! I’m hoping to win the Canon Powershot S95 Camera xD. I would love Camera or Amazon gift card. Thanks for your generosity :) I’m not in the US and I have your book, so either of the gift cards would be appreciated. A great Christmas to you both! i would love the camera or $50 card. sadly i will have no christmas this year, i cannot afford it. but lets see if im lucky to get something this year! Happy holiday to you Paula and Wanda. I hope this holiday season is great and you’re always getting lucky. I will be happy if i win the second Giveaway, Amazonian Profit Plan. This is great ebook and i lived outside the US. Hey gals, love the giveaways. I already “like” your page and will share this post as soon as I leave the comment. I would love to be entered for the book. And the second book. And the third one! And gift cards, that would be nice too. I would love to have the camera or the Amazon gift card! I would love to have Canon Powershot S95 camera because it would be great to me. I would love to have the Canon Powershot camera this Christmas season… :) Thanx a bunch! I would love to win a copy of your e book please. I would love to win the Canon Powershot camera. I take pics all the time and it’s time for an upgrade. That would be a great Christmas gift! Merry Christmas! I would love the camera. Thanks so much for offering this giveaway!! Would love to win the camera to start blogging my travels when I study abroad in 2012! Thanks for the giveaway!!! I would love to win the Canon PowerShot S95 camera!! Merry Christmas, Paula and Wanda! Thank you for your Christmas 2011 Giveaway. If I am picked by the randomizer as a lucky winner, I would be grateful to get any one of your gifts. In order of preference, since I don’t live in USA: the Amazonian Profit Plan, a $300 Amazon gift card or the $50 Amazon gift card. I agree with John-BR, Scooter and Ben that the Amazonian Profit Plan will teach me how to make money on Amazon and to buy my family all we need. Thanks for your generosity. I’d love to win either the camera, or the giftcard as I already have your fantastic ebook.. Thanks for providing motivation, I have tripled my amazon earnings, this year over last, just by following your example.. Now to only find the time to double it.. Thank you again. I’d love to win the camera. Got 7 kids. Pics mean the world to me. Just found your blog and am finding some really useful information here, thank you for sharing. As for the prizes would buy your book tomorrow but being flat broke just can’t so that would be my first choice followed by the gift card. Just discovered this post, hope for the camera, but gift card would be nice too. Thank you for the opportunity. Would love the camera; it’s time to replace my old point and shoot! I would like the camera or the gift card! Thanks! Long time reader, first time commenter. Great give away, I have ebook, so camera or card would be great! Keep up the great work as usual. Firstly, thanks for the opportunity to win one of these 3 great gifts! 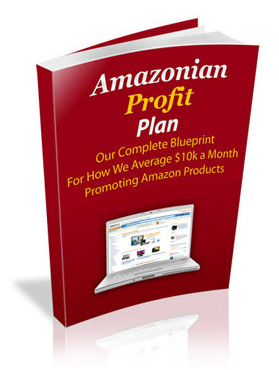 I’d be very appreciative I were to win your Amazonian Profit Plan E-book. I know that your E-book would help me to become a successful affiliate marketer in 2012. Thanks again and Happy Holidays!! I would love the camera, so I can take my family’s Christmas party! Thanks for all you do for the Amazon affiliate community. I wish you both a Merry Christmas and a Happy New Year…Stay focused. PS…I have APP…the camera or gift card would be nice. Would Love to win any of these! Although the Amazon Gift Card would be perfect! Tight Christmas this year, so no present for me or my husband, so we could def. use this for our gift to ourselves! Any of them. Hello, would like to participate in the Canon Powershot S95 Camera prize draw. What a great giveaway!! I would love to win the camera the Amazon card! Also, shared and liked your FB page! I would love to win the camera. Thanks for the opportunity. Plus this gives me ideas for my website. really really need a new camera and the $50 amazon sounds good too! I really want the Amazon gift card! I would always welcome the gift card for Amazon.com! I LOVE shopping online at Amazon more than any other place on the web, because Amazon has everything I want! I’m always pleasantly surprised when I browse through Amazon! Mama needs a new camera! I would love a camera! My 15 year old camera just died. Count me in! I prefer to choose camera..Merry Christmas and Good Luck everyone…^_^! I would love to win a copy of the Amazonian Profit Plan. I’ve decided on a niche I want to create an Amazon site for, but am nervous and want a plan to guide me. I really hope I win your ebook :-) Merry Christmas! I would love to win the Canon Powershot S95,. My old camera just died a few weeks ago and was looking at a new Canon, so thought I’d enter this giveaway. Thanks for this giveaway. I’d love to win the top prize, the camera. However, I don’t live in the US so the $300 gift card would be perfect. I bought the Amazonian Profit Plan about a year ago and it was fantastic. I quit my job and want to be a successful amazon affiliate like you. I hope I can win the Amazonian Profit Plan. Merry Christmas! I read this post and the one on your best day. I really enjoyed learning that you had a great day and it gave me quite a bit of inspiration. I am currently starting out with my first Amazon Review site. It is not up yet, but will be today (hopefully). I do not expect instant success but am hoping to learn more by reading posts on WF. Well I would love the e-book if possible. I want to learn as much as I can. What a great idea with this giveaway. If I am the winner I would like the prize to go to a charity, or even given to a person in need. We have local church run groups who do this. It would make their Christmas to have a prize like that. would love, love, love the Canon Powershot. a brilliant little camera is tops on my wishlist. am in canada though would happily take the $300 Amazon gift card. totally fun giveaway! i would love to win the camera or the amazon gift card since i already have your fabulous ebook. hope you two have some lovely holidays and a happy new year! I’d like the canon camera. thanks! I am really looking for a Canon S95 camera at the moment. Just to take it around with me and be able to make pictures whenever I can’t lug around a bulky/heavy camera. Unfortunately I’m not living in teh US… but hey, why not take a chance! Camera or gift card would be my choice.